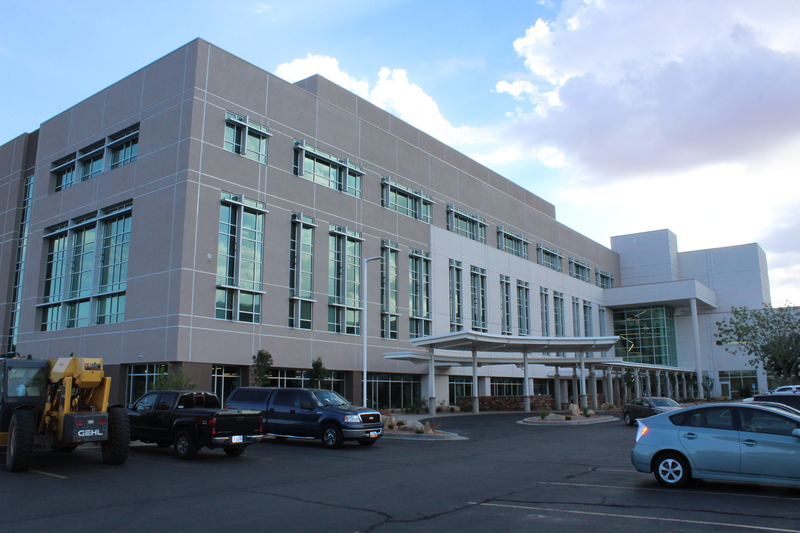 FEATURE — After years of planning and construction, Dixie Regional Medical Center is nearing the end of their consolidation project and will be celebrating the coming together of the two campuses with a “Growing Together Ceremony” Sept. 13, one day after the grand opening celebration featuring The Piano Guys. 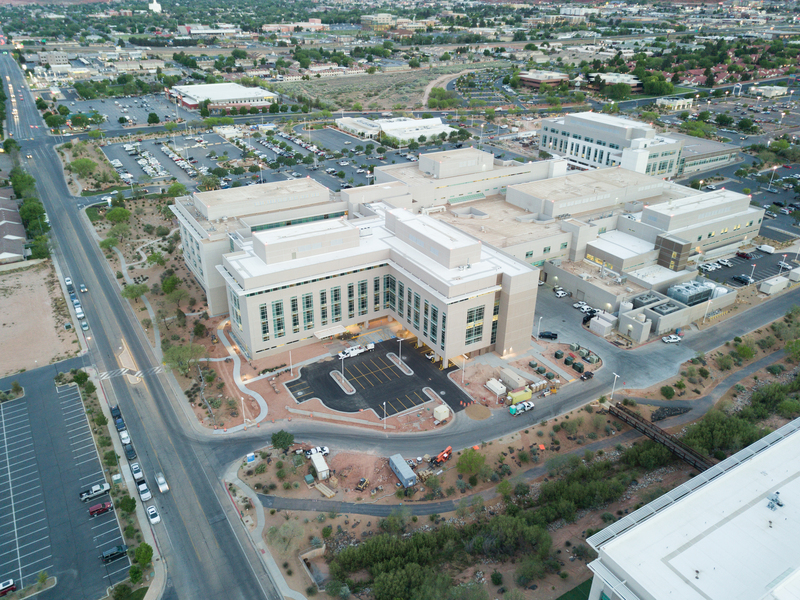 An aerial view of the Dixie Regional Medical Center River Road campus, St. George, Utah date not specified | Photo courtesy of Dixie Regional Medical Center, St. George News. The Growing Together Ceremony will take place at 5 p.m. at the entrance to the new Intermountain Women and Newborn Center. The 30-minute ceremony will include speakers, a ceremonial 400 East rosebush planting and a ribbon cutting. The ceremony is being held to commemorate the separate DRMC campuses becoming one again, and the speakers will talk about the services that are now moving from the 400 East campus to the main campus on River Road. A few centers have already moved, including the neurospecialty rehabilitation unit, pediatrics and the wound clinic with hyperbaric medicine. The Growing Together Ceremony will kick-off with neonatologist Dr. Erick Ridout, who will land at the ceremony in an Intermountain Life Flight helicopter. Ridout and Dr. Kurt Hales, obstetrician and gynecologist, will welcome guests and speak about the future of DRMC. Dr. Craig Booth, a family practice physician and the longest tenured physician still on the medical staff, will speak about the hospital’s history and what it was like when he first arrived in 1973. This will be followed by speakers discussing the hospital’s neurospecialty rehabilitation services, cancer center and the women and newborn services. At the end of the ceremony, Declan Mitchell, a 10-year-old boy who was the first – and smallest – baby to be born at the women and newborn center, will cut the ribbon for the new center. The ceremony – and subsequent tours – will serve as the newborn intensive care unit reunion the hospital hosts annually for the babies who spent time in NICU and their families. This year, hospital administrators wanted those attending the reunion to see the new NICU and other new services at the River Road campus. Everyone will have a chance to tour the new Women and Newborn Center. Staff will provide tours through the new facility, showcasing the new larger labor and delivery rooms, Simply Birth suites, low-intervention and high-risk rooms, prenatal care and mother-baby rooms and NICU. “It’s exciting to be able to showcase what our new rooms look like and what our new areas will be,” said Tiffany Hanson, director of women and newborn services. In addition to the new women and newborn center, the hospital is also celebrating the moving of the behavioral medicine and access center and the cancer center. Tours of the behavioral medicine center will showcase the new rooms, and staff will discuss what services they offer. The access center provides a place for people who are in crisis without having to utilize the emergency department. Therapists, social workers and psychiatrists are on staff to help those in need and connect them with community resources to further assist them. “It’s really quite amazing that we’re able to help people that are coming in crisis find resources and the community to help them through their care even after they leave us,” said Jeremy Nielsen, manager of behavioral health. The new center will allow them to go from seeing six patients at a time to nine, as well as increasing from 13 inpatient spaces to 18. Not all hospitals in Utah have an access center, and with behavioral health needs exceeding the nation’s ability to treat them, the center at DRMC is very important to the St. George community, communications director Terri Draper said. The tour of the new cancer center will showcase the genomics and precision medicine and research, the radiation and oncology department, imaging components, a new cafeteria, the education center and a Stanford University research lab, which is part of the school’s precision medicine program. The Intermountain Cancer Center of St. George will offer patients the opportunity to watch scientists perform the research that benefits patients through a window to the laboratory. The effect of allowing the researchers and patients to see one another is two-fold: It gives the patients hope and inspires the scientists, who daily see patients their work may benefit. “This is an awesome time for us to be able to take all of our comprehensive cancer care and move it into a beautiful new facility to really provide a healing environment for our cancer patients,” said Jane Jensen, the cancer center’s clinical program director. The consolidation provides all of these departments with the newer and better resources and technology they need to keep from having to transport patients to larger hospitals. The facilities also help the hospital recruit physicians who are at the top of their game and wanting to utilize such impressive assets. The Growing Together campaign was a $300 million project, and approximately $14.2 million of that amount was donated and raised by the community. DRMC officials have said they are very grateful for the community’s investment in the expansion and their passion for health care. Self-guided tours of the entire expansion will be available from 3-7 p.m. on Sept. 13 and 14, followed by the 28th annual Dixie Regional Community Health Fair on Sept. 15. Self-guided tours and the health fair begin at the Women and Newborn Center entrance. When: Thursday, Sept. 13, at 5 p.m.
Where: DRMC Intermountain Women and Newborn Center, 1380 S. Medical Center Drive, St. George.